What is it With Detecting and Camouflage? For those of you who aren’t subscribers to The Searcher magazine, first of all, why not? It’s a great read. 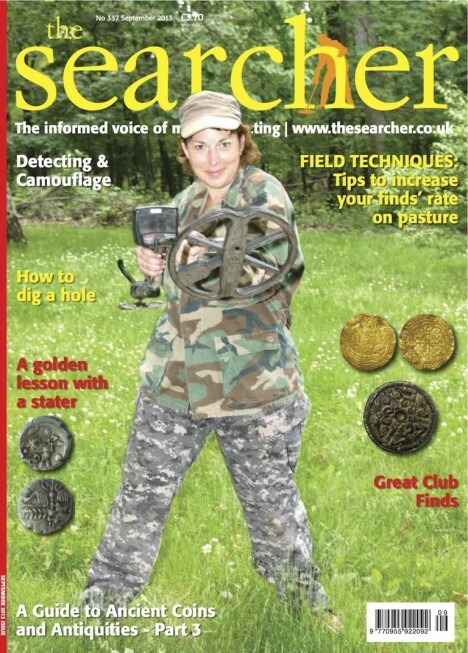 Some folks in the US may think oh it’s a UK magazine, and yes it’s published in the UK, but the articles and reviews are universal and of interest to detectorists everywhere. Second, the humorous cover photo (of me), which has drawn so much attention–especially from Warsaw Wally (he loves me, he loves me not…), did have a purpose, and its intent was to go along with my article What is it With Detecting and Camouflage? that I understandably wouldn’t post until the magazine had run its full course of readership for the month. Now that my ethical obligations are met, please feel free to peruse at your leisure the article that accompanied the cover photo that had “Warsaw Wally” in a rage against our machines. Maybe Wally will finally read it too? And for the record Mr. Barford, the background in the other photos are from a farm field in Long Island, NY–totally legal to hunt in this country, and taken at one of the Artifact Detecting Team hunts, sponsored by Minelab, and held specifically to benefit the Southampton Historical Museum click here to see how detectorist’s helped out the historical society. Searcher is a good Magazine and the people who print it are great met some of them in the past.Camouflage is for people who need to keep out of the way of Paul Barford.The big liar from Poland.he does not do any digging at all these days.just writes lots and lots of stories all made up in his crazy little pea brain mind. He says anything.trys to get noticed.one guy mentions him practicing in the mirror saluting and stomping up and down clashing his heals together and checking his tash. He hates metal detecting people so much he has lost his marbles.Many British metal detecting people despise him and wonder how he gets away with all those lies. I like to think of him as someone who is very bored and has a lot of time on his hands. It’s unfortunate he is such a mean spirited individual, but his attitude gives others fodder for their blogs, so I guess he’s good for something… maybe. Thanks! So should I assume it was more exciting a read than the back of a Cheerios box ? I reckon if you really want to get Warsaw Wally going, then adopt the 1986 Warsaw Bloc’s cammo pattern and change the detector for an AK47 – he’ll be bored stiff!!!! They have camo? I thought their color was red… Hmmm. Ich verstehe Das Auto, aber Das Vydanya– Ich habe keine ahnung. Are you pulling the Polish card on me? Will never understand the camo thing…sorry. Then again I am a lover of all animals so that probably has something to do with it. As for Barfart, I gave him your phone number. He said he would call soon…..I think he’s looking for a passage to the US. Thanks for giving my super secret phone number out. I charge twenty bucks for that, so now you owe me too. I booked him a flight on the “How high were you flying when your plane crashed” commuter. They have specials like the $99 one way “Eat crow with your peanuts” flight to Wonderland, and the $125 round trip “I know you are, but what am I” flight which goes in one ear and out the other, bringing you right back to the miserable existence from where you came. Great airline.